One of my favourite past times is to go to the websites of car makers from other countries and see what sort of interesting vehicles they sell. I love seeing what old models they continue to sell new in other places. Personally seeing every single new model they sell compiled into one list is quite satisfying. I’ve done Ford and now I’m tackling Fiat. FCA may be one of the biggest companies in the industry, but turns out Americans get their 57 varieties of Fiat 500s and not much else. It’s a different story elsewhere, mainly in Europe and South America. Apparently there’s going to be a massive shakeup of Fiat soon, with them just focusing on 500s and Pandas in Europe, with it’s place in the US market in danger, so it’s lineup may not be as big as this for a long time. Only Europeans get the facelift for some reason. The official car of Fiat, and they can’t stop creating variants, special editions and spinoffs. The 500S is kind of an Abarth Lite, while the 500e is an electric version only sold in 2 American states. The 500 is the perfect donor car for electrification so it doesn’t make sense why don’t sell it anywhere else, until you find out they lose $14,000 on everyone they sell. For those who want a really small Fiat and 5 doors and live in South America, you can get the Mobi, which is built in Brazil. It’s a super cheap budget vehicle and probably the cheapest Fiat they sell new. It’s the first of many Fiats you’ll see which come in a plastic cladding version, this one is called the Fiat Mobi Way. For whatever reason new Brazilian designed Fiats have a traditional FIAT script on the rear, instead of the normal logo. Panda and the Panda Cross. The City Cross looks pretty much identical to the Cross. The lovable Fiat Panda! It’s one of the few (only?) cars where the faux offroader version can actually do offroad. The thing is there are 3 of them. If I’ve got this correct, the Panda 4x4 is the offroading version, the Panda Cross is the 4x4 with extra ground clearance and more offroady styling (and should really be called the Panda 4x4+ or the Panda 4x4 Cross), and the Panda City Cross is just a FWD Panda Cross imitator. But hey there’s a stupid app edition of the City Cross too! There also used to be a Panda Trekking, which was a FWD imitator of the Panda 4x4! Gah! This is confusing! The Fiat Uno lives! The original lived until 2014, But in 2010 a new generation was released anyways. It’s basically a Fiat Panda style body, but using a different platform, built in Brazil. For a couple countries such as Uruguay and Columbia, only the Uno Way is available, your typical plastic cladding version. And yet the Uno Way doesn’t seem to be available in Brazil, just the regular version. Hmm. On a side note, I often pass a house that always has about 3 wrecked Puntos stuffed into their tiny driveway, and the road always has a couple Puntos. They still sell the Punto with facelift in India. OK, it’s not really that surprising considering they’re only just now getting round to discontinuing this car from 2005 in Europe. It was so old it eventually got a one star crash rating. I don’t know which Fiat executive had the idea of letting one of their best sellers in the most important segment in Europe languish for 13 years, but I will say the Punto’s styling aged pretty well as it did. The Linea isn’t much newer either, it’s practically a Bravo saloon. You know the Punto is pretty old when the emerging market counterparts have gotten 2 redesigns. Stop calling the saloon versions of your hatchbacks completely different models, you’re not fooling anyone! At least with the Linea they had the decency to fit a different bumper. Hey there’s a 500 in the background. Easter eggs in promotional pictures! The Palio was succeeded by the Argo in Brazil, and was subsequently discontinued, but it lives alongside the Argo in Argentina. It’s called the New Palio to differentiate itself from when it used to be sold alongside the old Palio. Makes sense, but the old Palio was renamed the Palio Fire so the new prefix became redundant! The Grand Siena is their small saloon for South America, it’s being replaced by the Cronos, but it seems it will still continue as a budget alternative. It’s called the Grand Siena because it was sold alongside the 1st gen Siena (the sedan version of the Palio), and the Grand was there to differentiate it. The 1st gen Siena was killed in Brazil though. But it still lives on in Argentina! And once again Fiat has added a redundant prefix to differentiate the 2 again. The Palio Weekend was the estate version of the Palio/Siena, but when the original Palio was killed, it was renamed to just Weekend in Brazil. In a few other places only the Weekend Adventure trim is sold, you know the version where it got plastic surgery and looks completely different. In Mexico it’s called the Palio Adventure, even though the Palio is not sold there anymore. The Tipo, Fiat’s return to the C-segment after the Bravo left us. In Turkey, where it’s built for whatever reason it’s called the Egea after the development codename of the Tipo, Project Ægea. Everyone’s favourite MX-5 based roadster is here! Basically the faux crossover version of the Punto Evo, that they gave a completely different name to convince consumers that it is totally a crossover from the ground up. Wait didn’t we already cover this? Well Fiat India has a second crossover based of the Punto, and the only differences I can find is the Urban Cross hasn’t got a rear mounted spare tire and has body coloured door handles. Why couldn’t this just be a trim version of the Avventura? It even says Avventura on the door cladding! Ah the 500X, which is nowhere nearly similar to the 500. Despite their plethora of vehicles with plastic versions, this is their only proper CUV. Even though the Panda is the one that can do actual offroad. There’s even a more “street” version with less plastic! Remember the Fiat Idea? I certainly don’t. Well Fiat Paraguay say they still sell it. Than there’s the 500L, the people carrier version of the 500, allegedly. Comes in regular and a 7 seater version called the 500L Wagon, even though Europeans call them estate cars and it’s not sold in America and it’s not really a wagon. I’m disappointed they didn’t call it the 500XL, but that would cause confusion whether it’s a larger 500L or a 500X. And it also comes in a 500L Cross, but doesn’t the 500X make that redundant? Always had a soft spot for these, even if the pre-facelift looks much better. Aw, isn’t his just the cutest little van van ever? Like most commercial manufactures, Fiat often lends their vans to other manufactures to rebadge. This used to be sold as a Peugeot and a Citroën, but for whatever reason only the Fiat is still on sale. Love that asymmetric grille, The Uno used to look like this until it got a facelift that made it all generic. South Americans aren’t blessed with such a cute van, they get an Uno with a box on the back instead. Still pretty cool though. The Fiat Doblò is their small van, sold as a Ram in the States. Also used to be sold as a Opel or Vauxhall, but PSA happened. Comes in all the versions you’d expect, extended wheelbase, passenger version, but they’re also available with high roof, pickup and chassis cab versions, which are very unusual for vans this size. Opel never got the pickup versions though. But they still make the older versions for Brazil, still looking pretty much the same as it did when it was killed in Europe. It has got a new version with a spanking of grey cladding, duh. Interestingly it doesn’t appear to be available as a cargo van, just a passenger version. How come? You don’t think people want their van as a van? On a side note, that’s an excellent shade of green. Fiat however had to call up Renault to rebadge their Trafic for their midsize offering. Or did they rebadge the Opel/Vauxhall Vivaro? Who’s van was it originally? And hey there’s a Nissan version now! Fiat’s largest van, the Ducato, which is also sold as a Peugeot, Citroën and for Americans, a Ram. It got a facelift a couple years back, but Brazilian made models still use the older bumpers for whatever reason. These vans are known for their weird headlight placement, but it’s not really that bad in person. Available just as a chassis, which makes it incredibly popular as a motorhome base. Look it’s got a red badge now! It’s totally brand new! They however still sell the old one in Argentina. They also used to in Brazil, because for whatever reason when Fiat Brazil discontinues a model, Fiat Argentina doesn’t. One of the few remaining utes car based pickups left, the Strada is the pickup version of the Siena EL/Palio. It has a regular workhorse version, and a higher trim, another example of Fiats where the higher trim has more unpainted plastic than the base model. Also, Veloster style doors are available. 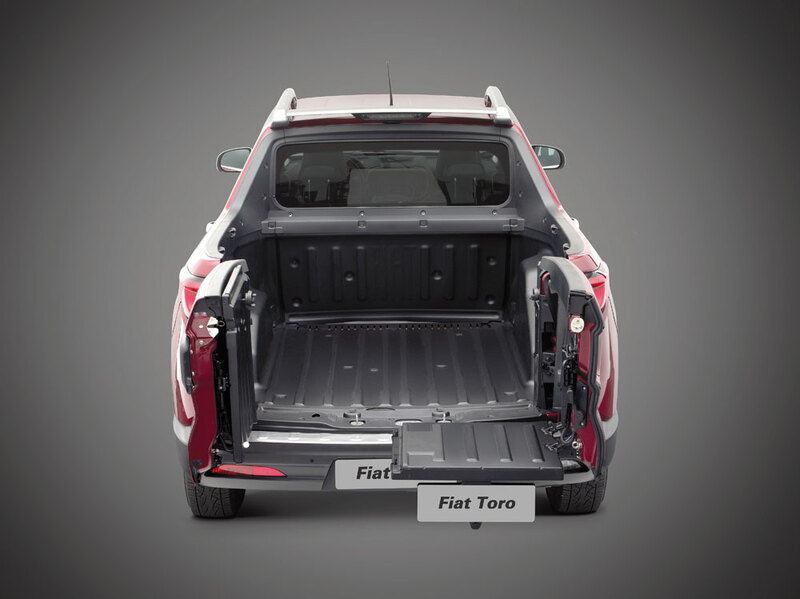 For a larger pickup, South Americans get the Toro, a unibody pickup based of the same platform as the 500X. Known for it’s weird barn door style tailgate. When I first saw it I thought, That’s stupid! When I got more details, I thought, That’s genius! Although Fiat are surprisingly good at making quirky pickups, Europeans get the more mundane Fullback, which is just a Mitsubishi Triton with Fiat badges. I used to get really annoyed when Internet strangers called it the Fiat 500 Abarth, and I would internally scream at them that it’s the Abarth 500. Now I don’t have to annoyed at that anymore! Well unless they’re European. Turn out elsewhere Abarth is treated a glorified trim level. In Europe it’s treated as if it was a different brand, and Abarth is treated as the make, although I think it’s still technically considered a Fiat. Like the standard, models in America it still hasn’t got the facelift and it does 160hp. I couldn’t find anything on whether they still sell the convertible version in America. If I’m correct the one on the left is a 595C Turismo, the middle one is a 595 Competizione, and a regular 595 is on the right. Europe has long moved past the puny power levels of of 500, with the Abarth 595 the entry model. It um, has 145hp. But as usual there’s tons of other versions. The 595 Trofeo edition however has 160, matching the US model, while 595 Turismo adds 5 extra horses over the Trofeo and the Competizione version has 180hp. Why do these models deserve the extra 100 again? It doesn’t have a side mounted Abarth logo! although they could’ve brought it to Europe too. The Fiata once again! Or should that be Abarta? Although the Weekend estate and the Strada pickup survive, the OG Palio Fire hatchback didn’t, although it had a good 20 year run. The Fiat Freemont was also recently killed, a Dodge Journey with a Fiat badge lazily slapped on. You can even still see the Dodge emblem outline on the grille! And Chinese car lineups always have some good gems, but unfortunately Fiat only sell the 500 there now. They’ve just discontinued the Viaggo, a rebadged Dodge Dart. There was even a hatchback version called the Ottimo! A Dodge Dart hatchback! So that’s all of them I could find. There might be some cars here that were killed long ago, but I’m mainly basing this of what they display on their websites. Is the Mahindra KUV100 the last 2 row 6 seater car left?